The ferric uptake repressor (Fur) of Bacillus subtilis called YqkL. Fur normally forms a dimer and interacts with a specific operator named the fur box to repressor genes further down-stream. At higher intra-cellular iron concentrations, Fur binds to iron to form a holo-repressor and then binds to the fur box (Figure 1) and represses gene transcription. Genes controlled by the fur box usually code for iron binding protein and gate mechanisms within the cell (about 40 genes are controlled by the fur box). Figure 1. Fur box consensus sequence. The fur box pattern that is conserved by in all different fur boxes is the palindromic sequence: TGATAAT-N-ATTATCA (N being any base). 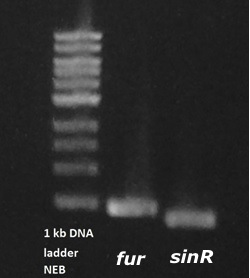 Most fur boxes are 19 to 21 base pairs and always contain this 7-1-7 palindromic sequence. The most recent one posits that the minimal binding site for the Fur dimer is TGATAAT-N-ATTATCA and that most fur boxes contain two repeats of this pattern, such as TGATAATGATAATCATTATCA (Baichoo and Helmann, 2002).